We have been listening Rafi Sahab’s umpteen number of melodious songs day in and day out. It is difficult to choose the one to be shared here on his PUNYA TITHI today. Whether I choose Yaad na Jaye Beete dino ki…or Baharo Fool Barsao or Japan Love in Tokyo,or Jaane chaman shola badan….or Taareef karu kya uski or O duniya ke rakhwale…or Ai dil hai mushkil jeena yaha…????? Oh. A big problem for music lover to select one song for sharing with all…. However, to make my life easier I decided few points and concentrated on those to have one of the best songs of Rafi sb. When I thought on a common denominator Melody, it made my choice much easier as I knew that, whatever may be my selection, the song would be Melodious as it was sung by King of Melodies himself. I surely wanted to stick to Golden Era of Hindi Film Music and counted for a song from a movie of 1964. (ThePeak of Golden era of sixtees).The movie selected was DOSTI. Rethinking on my choice, I was puzzled to go further as all the songs from Dosti were super duper hits and too melodious. It may not be an exaggeration to assume that, DOSTI was a movie where Mohd Rafi sb was a real hero of the movie the way he contributed his talent. It was Rafi sb who had Lion’s share in making Dosti successful all the way. Though, Dosti itself was an excellent movie with strong back up of story writing, simple but very touching act by Sushil Kumar, Sudhir Kumar and all, the fact remains that, The Music and especially the melodious songs played a great role in making every scene effective in the movie. Laxmikant Pyarelal duo were Masterpiece to create everlasting impact through these songs in the movie. LP had right choice before them when they requested Rafi Sb to contribute for the movie and it was again Rafi Sahab who made each song a gem of itself and memorable for ever. Each and every song of Dosti was par excellence and became super duper hit. We recollect all these songs and are dumbstruck to see the beauty behind the songs. Majrooh Sultanpuri was master creator to pen down the songs showcasing Philosophy of Life in simplest wordings…One can recall the lines of Rahi Manwaa Dukh ki Chinta..( Start itself had a philosophical touch when Majrooh sahib wrote and Rafi sb sang…Dukh Ho Ya Sukh Jab Sadaa sang rahe na Koy, Fir Dukh ko Apnaaiye Ke Jaye to Dukh na Hoy).Thus life explained in two simple lines by charismatic Majrooh sahib..hats off to him. Each song has a different style and one can easily enjoy the variations produced by Rafi sb when singing these melodies. The tunes were so touching and catchy that, Remembering these songs even after 50 years of creation does not require special efforts and one can rejoice remembering and humming these melodies which are immortal. Chahungaa mai tujhe …had a different style when Rafi sb takes MITWAA MERE YAAR.. to highest pitches and put us there hanging with the thoughts to ponder upon. 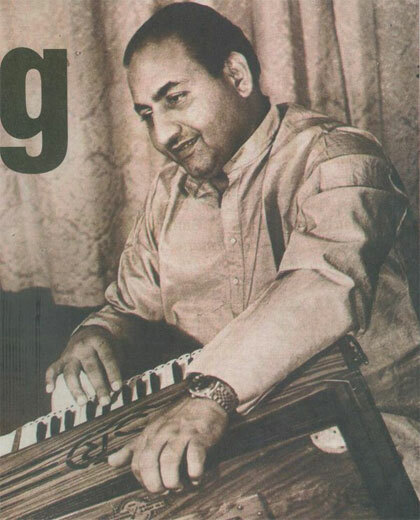 Mera to Jo bhi kadam hai had shown us a different style of Rafi sb just opposite to Chaunga mai tujhe…as this song was sung in lower pitch but so melodious he was that, one can easily be with him in this song too. Expressions was his mastery. Koi jab raah na paaye was no exception when he melodiously convinced the listener for his viewpoint just by sheer expressions. RD Burman was also associated with the movie when he agreed to play Mouth Organ tunes for Laxmikant who was his friend and thus we had all such beautiful tunes from a legend. While we have all these beautiful numbers form the same movie by one and only Rafi sb, I had selected the most melodious and impressive song for today. Jaane Walo Zaraa mud ke dekho Mujhe- The genius RD Burman’s melodious piece on Mouth Organ starts the song. Along with humming of Rafi sahib adds flying colors further. Group violin was a strength of LP and they used it so effectively here too. Rafi sbs rendition was with full of expressions and justice to each and every word penned by Majrooh. The song was picturised on a blind person (Sudhir Kumar) and hence his thought pattern was very well expressed by Majrooh sb .He gives the message to the world by saying Is anokhe jagat ki mai takdeer hun, mai vidhata ke haatho ki tasweer hun…He considers himself a blessing from the GOD rather than cursing himself on his blindness which itself spreads a very powerful positive message to the society. Moreover he tries to convince the crowd that, life of a two eyed ones and the blind ones are alike when he calls for Mere paas aao chhodo ye sara bharam,, jo mera dukh vohi hai tumahra bhi gham…what a thought of positivity by equaling himself to the lucky ones of the world. It is a message particularly to the ones who have a habit of complaining and crying always in the society. Let them learn to think radically opposite and start living the life joyously instead of wasting time in all sorts of complaints and negativity. Dekhta hun tumhe, Janta hun tumhe , Lakh Anjaan hun mai tumahri tarah…was an expression where complexity of life is revealed in very simple words. Excellent use of Guitar, Mandolin, Group Violin and Rhythm instruments like Dholak and Tabla took the song to great heights. Above all, Rafi sahab’s sweet , melodious voice with clear expressions and variation has made the song memorable for ever. On his Punya Tithi, we once again are reminded and attracted by his purely divine voice and want to stay for a while with him through his melodious calling … JAANE WALO ZARA MUD KE DEKHO MUJHE…. This entry was posted on Sunday, October 13th, 2013 at 8:26 pm	and is filed under Meri Awaaz Suno. You can follow any responses to this entry through the RSS 2.0 feed. You can leave a response, or trackback from your own site. dosti …..turning point of MRLP combination. Such a tremendous article which is fully devoted to Our’s Guru RAFI SAHIB I listen that on this movie Rafi Sahib not get any penny for singing all the songs and also justice with all the songs nobody singer done it. Is it possible to post these songs in full in Hindi. That will be great. Absolutely a very difficult task to choose favourite songs sung by the legend Mohd Rafi, and I have to say I never tire of listening to the same songs over and over again so much so that the songs that were my personal all time favourite three decades ago are still my favourites. This I can’t say for any other singer and to prove my point the film songs of today which are popular today when the film is released are forgotten in a few weeks and then people have moved to the next song, and so on…….. I Just simply adore this great man no one can ever compare to him, he is only second to god and definitely not to any other artist. One of LP best ……. I read somewhere that Rafi Saab was instrumental in composing Dosti songs to boost his favorite MD Laxmi-Pyare. With Dosti LP had elevated to the mainstream MD of Hindi movies. All Brilliant songs in the movie. The film and its songs still linger on my memory. We were taken to the movie Dosti from our school. The teacher had given us an insight to the movie, its story line etc., as we from a non-Hindi speaking state could not grasp the dialogues. The melodies, the characters and the story line are still ringing clear and loud, though the film was seen half a century back. Salute the Geniuses who made all this possible,especially Rafi Saab for his rendering the melodies so beautifully and wonderfully. Ek Chingari Aankhon ki dil ki lagan ban jaathi hai,yeh duniya usiki zamana usika,tum jis pe nazar dalo us dil ki khuda hafiz,kaajal waale nain churake,taqdir ka fasana jaa ke kise sunaon……..I have a set revolving favourites….in fact all Rafi saab’s fans are extremely lucky that they have hordes and hordes of superfantastic numbers. Really you are deserved for an applause from Rafians for this excellent article on our beloved Rafi Sahab. it is very true that the film DOSTI which was starred by new comers became a super hit due to its melodious songs sung by Rafi Sahab. It could challenged the other multistarrer films like SANGAM, WO KAUN THI etc. only due to its songs. the credit for its success goes to Rafi Sahab. It was learnt that the producer of film DOSTI was not agreed to engage LP for composing its music, because they were also new comers in the film industry. Rafi Sahab interfered the matter and convinced them about the quality and efficiency of these new music composers LP and also offered him to sing all the songs with free of cost. The confidence of this great singer lastly established that everybody can do something if they get chances and encouragement in time. All the songs of DOSTI film became super duper in the ear 1964 and Rafi Sahab also honored Film Fare Award for best male singer for his song CHAHUNGA MEIN TUJE. Not only the producer but the new comer LP also got their recognition in the film industry through the film DOSTI. All the songs of film DOSTI are still very popular and listening by all the true music lovers of this world. Best wishes for all Rafians. To top it all, no other singer but Rafi opted to sing for unknown new actor. He sung all the songs of Dosti free. Rafi always sang for free for new producer, director, actor or music director who could not afford his fees. Very true. It is very difficult to choose songs from Rafi Sahab as all songs sung by him are special due to him. His voice always rings in our ears. My 2 and half years old son insists me on playing songs of him. He cann’t express himself clearly but I understand his heart that he has started distinguishing Rafi Sahab from others. Very Nice Article Shrirang Nawathe Ji…………….